Got a good night sleep and took our last trip to Montmelo. When we got there the town was even busier and the queue to the Tractor Bus was massive so we just walked it. 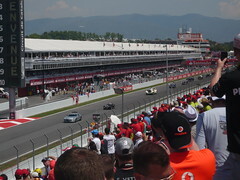 We got to the track at about midday and caught a bit of the Porsche Supercup race. It was actually quite good to watch and had a couple of good scraps. It was won by an English guy called Sean Edwards. After the Porsche’s we sat in the shade for a bit and waited for the driver’s parade. I’ve seen these on TV before and the drivers are usually on the back of a trailer together and wave, and in the 20 seconds it takes them to pass your view point. However, Barcelona did a good job. All the drivers were in the back of convertible classic car. 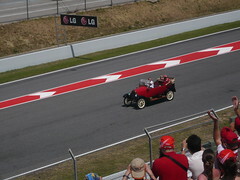 Following the safety care the first driver was Vettel, then Webber who got a bigger cheer. Then the Williams drivers (Barrichello got a “Rubenooooooo” shout from me). Next was Alonso and the grandstand erupted! Schumacher came up the crowd were cheering exceptionally loud. Schumi lapped it up and starting blowing kisses. 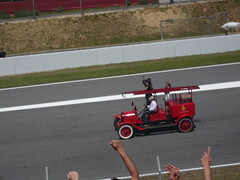 I realised the cheers were for local boy Alguersuari behind him. 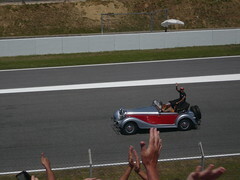 Further down Hamilton was getting pantomime boos and jeers, but credit to him, he had a big smile waving to the crowd. I think he was enjoying the pantomime villain status. 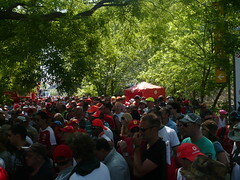 All the drivers got a good reception (except Hamilton, though the English fans around tried their best!). However, the biggest cheer went to the attractive CanalNou TV presenter who was recording a bit to the camera. The Spaniards behind us were the very loud in appreciation. Jake Humphry wouldn’t have got such a cheer. Jim Rosental maybe. A good thing about our seats was that once the parade had passed us and the last car had gone into turn one, it wasn’t long until the safety car and Vettel came into view coming out of turn 5. Another cool thing was once Alonso’s cheers were noticeably travelling through embankment opposite (as where the Hamilton boos). 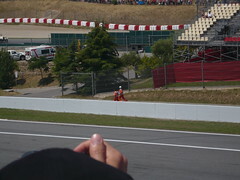 Another nice moment was when a marshal was running behind the wall at the opposite side of the pitlane, and our grandstand went wild by clapping and cheering for him, and he gave us a wave. Once he ran round the corner, out of view of the grandstand, everyone started shouting for an “encore” and the marshal ran back out waved and turned back, which was met with another chant for an encore. The marshal “preformed” three encores! 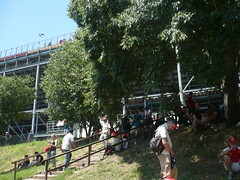 So after we essentially watched the driver’s parade twice we sat in the grass behind the grandstand to eat our lunch. We returned to our seats just before the pit lane opened so we could watch the cars spin around a few times and do their practice starts in front of us. Once the pit lane closed it was time for the anthems. The Spaniards behind us did their best to sing along to a lyric-less anthem, along the lines of “da-da-da-da-dadadah”) and then they swapped over for the Catalan anthem. During the Catalan anthem our grandstand appeared on the big screen again but I didn’t spot myself, again (BBC don’t show the anthems anymore so I couldn’t check when I got home either!). With fifteen minutes before the start, the grandstand was the busiest it had been all weekend, and the crowd did their best to amuse their selves. The Spaniards were trying the Mexican waves again and chanting “Alonsooooooo”, and the big screen was showing random drivers and people on the grid to various levels of cheers. Some Moto GP rider appeared as well, to much applause. The big screen in front of us started showing the official FOM into animation and it was nearly time. As the big screen was showing the TV feed the now obligatory shot of the “Paddock club” came on the screen and we were treated to shots of the great and the good drinking champagne and what not. This was met with a lot of booing (not as much as Anthony Hamilton mind). 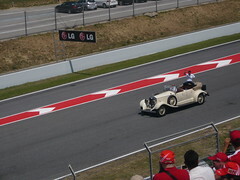 The parade lap got under way and everyone stood to cheer the cars as they passed. Once they got round they lined up on the grid. I had to strain to see the cars at this point so I watched the big screen to see the lights. Even though the grid was quite a distance away the noise of the engines were getting louder. I stood up as in a few seconds the cars would be flying past, the revs were getting higher and the atmosphere was building. The lights went out and the crowd were cheering (I had Murray Walker in my head shouting “Go! Go! Go!”). 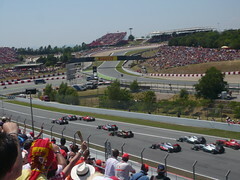 Alonso got a good start of the line, passing Hamilton, which pleased the crowd. I kept watching Alonso hassle the two Red Bulls. 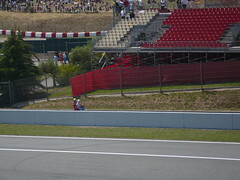 Both Red Bulls were beside each other and it appeared Alonso would be stuck behind them into turn 1. Alonso then just swept out to the right and darts down a gap on the road, which from were I was sitting seemed rather tight, and managed to brake into the corner and overtook book Red Bulls. For a second there was an air of disbelief then it sunk into the crowd that Alonso had in fact taken the lead and there was a roar of cheering! The cars went into Turn 3 so it would be another thirty seconds or so before they got into view again so everyone watched the big screen with anticipation. When Alonso hit turn five, and came back into view, you could hear the crowds cheering when Alonso met their part of the track. It was so loud it did drown out the cars and the cheering followed him round until he went out of view again. Back to the big screen again until Alonso led the pack down the pit straight and everyone in the grandstand got up and cheered. 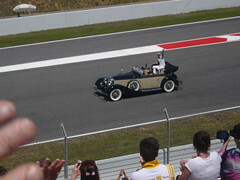 Every lap, for the next eighteen or so, the crowd rose to their feet cheering Alonso on, as he passed. I was counting down the amount of laps, hence the amount of chances Vettel had to pass Alonso into turn one, but it wasn’t to be as after Vettels second stop he got out with no traffic and managed to take the lead. Still, it was nice when it lasted and it became quickly evident that Alonso was going to start going down the listings. I just relaxed then and enjoyed the spectacle. Usually keeping an eye on the big screen and watching the cars pass down the pit straight in front of us. Crowd appreciated Button taking Webber down the outside of turn one to the sound of “wow!” and applause. Perez was also passing loads of people into turn one, much to the joy of the Mexican couple infront of me who were hi-fiving after each pass (especially after he overtook Massa!). Massa later on crashed out right infront of us, however that bloody empty grandstand was in the way so we couldn’t see anything jut the dust in the air! 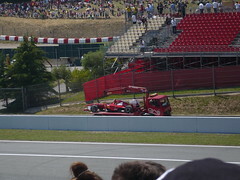 Though Massa did go past in a mophead in front of us and his car was taken back to the pits in front of us too! I thought going to Barcelona Grand Prix would be good as in previous years not much happened and therefore would be easier to follow from stands. In fact the opposite happened as it was full of overtaking but it was great to watch. There was even stuff which the TV missed, for example, some of Perez’s overtakes! Towards the end crowd was enjoying Hamilton chasing down Vettell, though he ran out of laps. People started leaving before the end, but we stayed to watch the podium, even waiting to see if they would let us on the track so we could go down to the pits and shout abuse at Eddie Jordan, but it looked like it wasn’t happening so we got out of there. Took our last walk through Montmelo and got in the ridiculously long line to the train station. Once the train arrived there were no seats so I just stood, then at the next stop a load of cub scouts got on, with their camping gear and decided to sit on the floor. Had to watch my footing, as they were so small I could crush them with my oversized feet. We got off early to go do some touristy things (I dragged Leona to Montmelo for 4 days, it was only fair!). 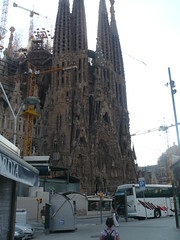 We got off at Clot and got metro to Sagrada Família . Thankfully the kids got off at the same train station so I didn’t have to worry about squashing them. After looking at the big church and bought some souvenir tat for family we went to a McDonalds for a cheap and cheery dinner, also we took advantage of the free wi-fi so I could read up on the race I had just been to (! ), also read up on the Premier League scores to see who got relegated. 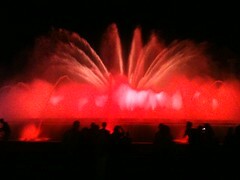 After that we went to the magic fountains, which we weren’t able to see due to the motor show. There was still motor show related things about, like fences and all but that didn’t stop enjoyment of the fountains as they looked nice. 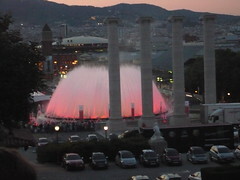 We first watched them from a distance (at Mirador del Palau Naciona ) and then walked the long way round to the bottom. It was now dark so we got the metro back and went to find a bar. Walked around for a bit and witnessed an attempted pick pocketing (the girl “victim” realised what was happening and punched the guy in the face and the three bad guys ran off). With that we decided to avoid the dodgy dark alleys we were walking down (seriously!) 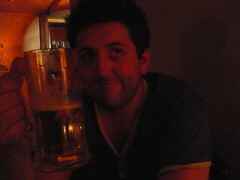 and went to the bar across from our hostel (most bars down that street were closed). I inhaled my first pint and savoured my second. They were playing the Strokes first album while we were there, which was nice. This entry was posted in barcelona, f1 and tagged alonso, barcelona, cataluna, f1, ferrari, grand prix, spain, travel by conradder. Bookmark the permalink.